Nowadays, there is hardly any field left where the 21st Century women are not leaving their marks. In the field of journalism, the women are not only a pretty face to read the latest news. Today, the modern day female journalists are traveling to the war front to get the news of the war, reaching amidst the terrorist attacks or fighting for a social cause to unveil and establish the truths. The journalist, editor, and the columnist Barkha Dutt is not only a celebrity news reporter; she is also a woman of extraordinary courage to bring out truths. From the Kargil war to Mumbai attack 2008, Barkha Dutt had brought out the extraordinary facts in front of the rest of the world. Based on Delhi primarily, Barkha Dutt was born to a father who was an Air India official, and a well-known journalist mother. Her younger sister is also a journalist in CNN-IBN. Thus, she always has given the credit of her success to her mother Prabha Dutt, who had shown a new ray of hope to the women journalists in her time. After finishing the graduation degree and Mass Communication from New Delhi, she had joined the NDTV as a Journalist. After that, she had completed her Master’s in Journalism from Graduate School of Journalism located in New York, which is the part of the famous Columbia University. 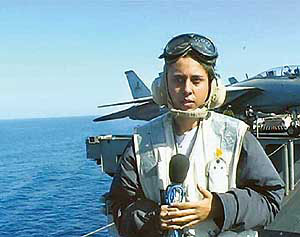 Barkha Dutt had first come in the way to fame for her extraordinary work from the war front during the Kargil War 1999. The courageous woman had traveled to the Kargil while the war was still ongoing and started to report the live telecast from the war front. Her constant live reporting from the war front had left some of the trails of controversy. It was said that due to her act of bringing out the facts in front of the world had also helped the terrorists to locate the existence of the Indian Army. Her live reporting and the flash of her camera had led the terrorists to a base of Indian Army. There are thousands of conflicts of thoughts regarding the live reporting of Barkha Dutt in Kargil war 1999. Yet, above all, her courage was really impressive to connect the rest of the world with Kargil during the war. She got “Padma Shri” Award in the year 2009 for her reporting on the Kargil war. After Kargil war, she went on bringing the true stories of conflicts from the places like Kashmir, Pakistan, Iraq and Afghanistan. Due to her fearless way of showing the truth, she had often gotten into trouble. Like during the year 2002, amidst the Gujarat Riot, she was caught in uttering the words like “Hindus” and “Muslims”, which was banned by the Press Council of India. It is often believed that her detailed coverage during the Mumbai Attack 2008 had helped the terrorists to locate the innocent victims who were hiding in the Taj Mahal Hotel and Oberoi Trident. Barkha was also involved in the case of Nira Radia, which was called Radia Tape Controversy. She had faced a jury and pleaded her innocence onscreen. Barkha Dutt attempt to bring the truth had often taken her from bringing the latest news from the Tsunami affected area to in the middle of the riots. Over and over again her fearlessness had inspired many female characters in Bollywood. Like the character of Preity Zinta in Lakshya, the Character of Rani Mukherjee in No one Killed Jessica. The act of courage by this extraordinary woman is encouraging the Indian women to do something courageous even in their normal lives.